Perfect for your patio or garden area, comfortable and weatherproof. 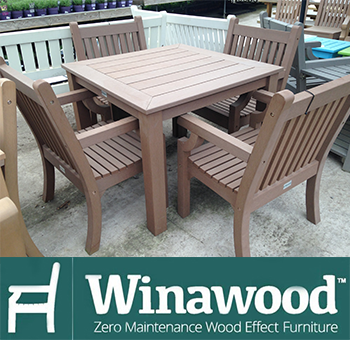 We sell a range of weatherproof garden furniture, which is ideal for a commercial environment, allowing you to leave it outside all year round without worry. In stock, for immediate delivery. We deliver, build and clear the rubbish away. Over 17 years selling garden furniture. 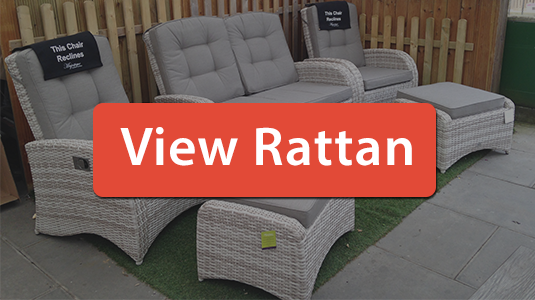 Whether you’re looking for luxury rattan reclining furniture for a spa, or composite wood-effect furniture for a practical seating area in your park or gardens, we’ve got you covered. This traditional looking garden furniture is both durable and visually appealing, ideal for parks, gardens, care homes and others. Weatherproof – it can be left outside, uncovered, all year round. Heavy duty – the smallest bench is substantial in itself, weighing 35kg. Wide arms – supportive arms make it easy for anyone to get in and out of this furniture. Wood-effect – a grain effect makes it feel natural, noone will notice the difference. 2 year warranty included with free replacements. 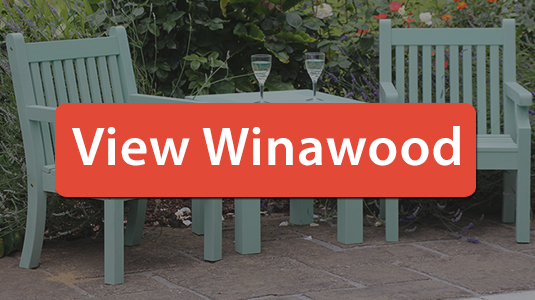 You can browse the full range of Winawood available on our shopping website here. You can also browse the video here. 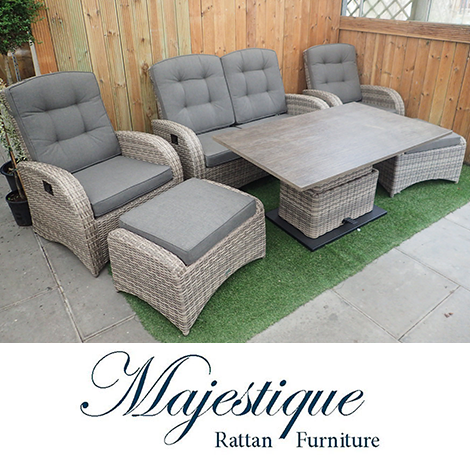 For the ultimate luxury environment in your commercial space, choose from our range of Majestique reclining rattan furniture. Extra thick cushions, and an adjustable hydraulic reclining mechanism make this the crème de la crème of rattan furniture. Your guests will be blown away by the range of rocking reclining chairs, which with their built in footrest are simply divine to sit on. This rattan is weatherproof and UV stabilized, meaning it will not rot, fade, or degrade in any way when left outside. The frame is made from strong aluminium that will not rust, allowing you to leave these sets outside all year round. 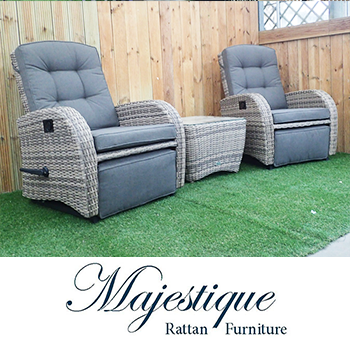 To browse our entire range of Majestique reclining online, see our online shop here. 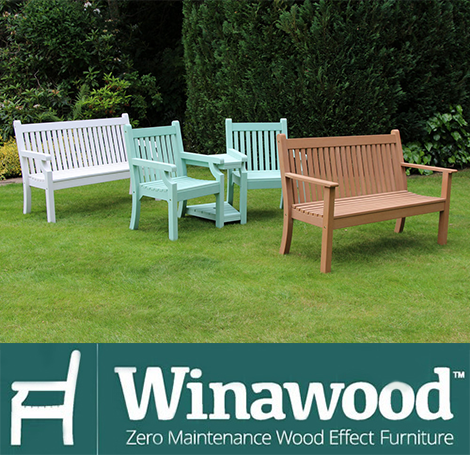 With over 17 years in selling modern garden furniture, we know a thing or two about our product range. We offer a slightly smaller, but better quality range than our competitors, with furniture designed to be both comfortable and practical. You can choose from a range of tables, chairs, and extras, in various colours and materials to suit your needs. The most typical form of commercial garden furniture that is available on the mass market is a table, four or six chairs, and a parasol. However, picnic tables and chaise lounges are also very common examples of the garden for Commercial gardens might not be a common sight in cities, but small towns and houses located away from the heart of metropolis or urban centers usually sport outdoor area; typically a garden. And no garden is complete without furniture. Garden furniture comprises of many items, some of which are essential whereas some are put up for enhancing the beauty. A table consisting of two or four chairs and a parasol. Long chairs also called chaise lounges. Bistro sets, companion sets, and bar sets. Plastic, teak wood, aluminum, wicker and wrought iron are some of the commonly used materials. Some of these require regular maintenance while some are durable and can withstand harsh weather conditions. Furniture for garden is available in several designs, styles and shades. Outdoor furniture, need not be expensive. Check out various newspapers, websites or billboards, and you are sure to find a garden furniture sale in your vicinity. These sales outlets offer great discounts; almost 40% to 50% off the listed price. One question that may bother you is the quality of the products that are available at these sales. Well, to cut the long story short, these garden furniture pieces are of the same quality that you might buy from a regular store. The next question which immediately pops up in the head is. Why do these retailers offer such massive discounts? The answer is to offload old stock or old designs. One of the most versatile furniture for the garden is a sun lounger. Sun loungers are reclining chairs which are used for a myriad of tasks such as; relaxing, sun bathing or enjoying a book with a drink set on a small holder on a beautiful autumn afternoon. These come several designs. Some of them have fabric based seats with a metal frame while there are others that are made of wood. Designs from the latter category typically have a mattress to provide extra comfort. As summer and spring approaches , it is likely that a large number of people will be seeking to purchase outdoor Furniture to be able to sit outside and enjoy the sunshine and the pleasant weather that the seasons are supposed to bring. However, if you look to purchase outdoor furniture from a specialist provider of such goods, or from a garden center or home ware supplier, it is very likely that the furnishings have come from a place of wholesale. 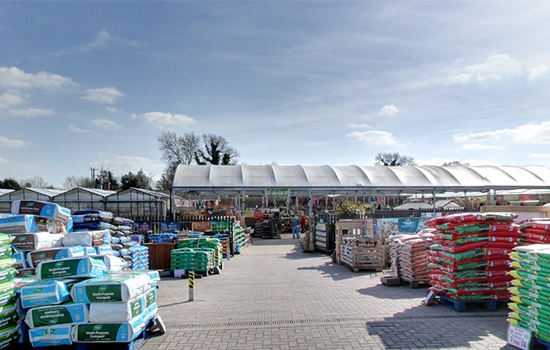 If, however, a potential stockist or buyer is looking to purchase a set of garden furniture from a wholesale supplier, it is more than likely that they could make considerable savings in comparison to buying from a specialist dealer. There are many websites now that specialize in the wholesale of items ranging from clothes, electrical equipment, and (as already suggested) wholesale garden furniture The advantage to a stockist or buyer when shopping on the internet is there is a likelihood that there will be a good range of products to choose from for their clientele’s needs.